Inspired by this films recommendation on “The Forgotten Filmcast” I have slipped this in a bit earlier than it was scheduled to show up. This is another of my “Movies I Want Everyone to See” series that was originally published on the defunct site “Fogs Movie Reviews” in the Fall of 2013. “Into the Night” is a film that I recommend for a somewhat narrow range of reasons. Although it is referred to as a comedy, action, thriller, it barely qualifies in each of those categories. Don’t get me wrong, there is a lot that is funny about the movie, and there is some action and tension along the way, and what could be more thrilling than seeing Michelle Pfeiffer at the peak of her beauty and charm? The real reason to see this movie however is the tour of Southern California culture from the 1980s that you get along the way. It is a very loose film with some nice sequences and dialogue but as a film it seems to lurch forward and wander around the story at times, but oh what interesting times. An essay over at A.V. Club, classifies this film and several others, as films which fit into a particular genre, actually called into the night films. The classification is based first on story line. The lead disappears into another subculture, usually starting with a night time excursion. The second point the essay suggests is that these mostly eighties films are sociological examinations of the conflict that the baby boomer generation feels over the rejection of the values championed by the counter culture of the 1960 and 70s by the preponderant culture in the 1980s. It is an interesting point and as a paper submitted in a graduate writing class in Cinema, it probably scored the author an A. Let’s extend their point for one more comment, all of the films that were mentioned (with the exception of two John Hughes films which probably don’t fit) were culturally marginal as well. When this film was released it received quite negative reviews from the critics. The New York Times was very dismissive but Roget Ebert went one step further, giving the film a single star rating on his scale. Both reviews focused on the insider nature of the movie. The film features cameo appearances by a variety of Hollywood types, including at least 17 film directors. The suggestion here is that the film was mostly an excuse to get a bunch of friends together and have an extended party at the studio’s expense. It is not possible to say for sure that this was not the case, but it can be said that those guest shots are not distracting from the movie. While sometimes the interjection of these actors, directors and writers did turn the movie into a game of “spot the hidden celebrity”, that added to the fun of the premise and emphasized what the movie is about. The subject here is Hollywood itself. A quick plot summary: Ed Okin is an aerospace engineer suffering from insomnia and job burnout. After he discovers his marriage is even less than he thought it to be, he drives to the airport to clear his thoughts, maybe with the idea of going to Vegas for the night. Just as he starts to fall asleep in his car in the parking structure, a woman screams, jumps on the hood of his car and asks for help. Men are chasing her and guns are blazing and he reacts instinctively by driving her off. That woman is Diana and it turns out she is involved in a smuggling escapade. The two of them travel around Los Angeles for the next twenty-four hours, trying to figure a way out of the predicament they have become trapped in. The plot involves Elvis impersonators, high stakes gambling,film production, real estate, high end shopping and the fall of the Shah of Iran. As you can tell, the movie meanders and touches on lots of different elements. Here is the real deal for you though. You have to pay close attention because it is not front and center of the movie. The subject of the film is how the City and the Hollywood community work. Jeff Goldblum’s character Ed, is an engineer in an industry in Southern California that the Hollywood people think is boring. They show him at his job, being disinterested, he complains about not caring himself. To the showbiz world, this validates their view of themselves. Unlike Ed, “We are exciting”, “We are different every day”. Diana is a beautiful woman who came to Southern California in all likelihood to be a star. Instead she falls into a relationship with a rich older man. There is a cliche of Hollywood that you can see everyday as you drive through town. Later, the older man seems to discard her, another Southern California dream gone bad. As you watch the film progress, you get a travelogue of L.A. area haunts, usually of the rich. The yacht of Diana’s older lover is in Marina Del Rey. She and Ed visit a set in Hollywood and meet up with one of her friends who got into the Biz, by sleeping with the producer. They suffer the indignity of being escorted off the set and of being rejected by her brother, whose connection to the entertainment business is as an Elvis impersonator. Later in the film they stroll through Beverly Hills shopping district and spend some time in the Beverly Wilshire Hotel. There is a car chase through Century City, in that most annoying of L.A. locations, a multi-storied underground parking garage. If you are from the Southland you know that a parking garage is a necessary anathema. This is a car culture and Ed and Diana end up in the most unlikely vehicle in L.A., a taxi. To make matters worse, the taxi is chased through a parking garage which residents hate, since free parking was at one time a birthright of Angeleno’s (those days are long gone). It wouldn’t be L.A. if there were not a beach scene, so we get a murder in Malibu. The whole movie is really a critique of the L.A. lifestyle. Everywhere in the movie are L.A. references. In the opening sequences there are radio shows playing in the background and defining what the radio was like in Southern California. People from out of the area will not understand why they are watching references to car salesmen in commercials. Pete Ellis was ubiquitous on TV at the time, he had car dealerships in all the major American brands at some point or another. Most of you probably have a commercial jingle or two stuck in your head. Those earworms are often a result of repetition. “Pete Ellis Dodge, Long Beach Freeway, Firestone Exit, South Gate.” It doesn’t sound all that memorable, but you put a catchy tune behind it and play it fifty times a day on the local TV stations it will be. Twenty five years after that dealership went away, the sound is still ringing in my head. Cal Worthington is famous in So. Cal for his silly TV commercials where he mocked another car dealer who put his dog in commercials selling cars. Cal’s dog “Spot” was a tiger, an elephant, a killer whale. He would do really loopy things like wing walking and then put them in the ads. “Into the Night” is filled with those late night TV ads in the backgrounds of several scenes. 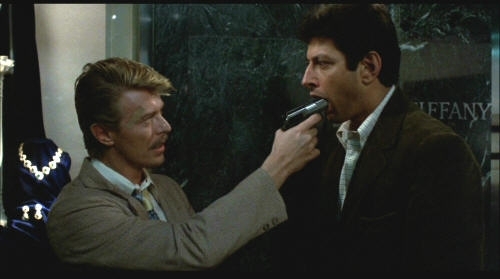 Another odd reference to show business, is a fight to the death between two characters played by Rock and Roll Hall of Famers Carl Perkins and David Bowie. 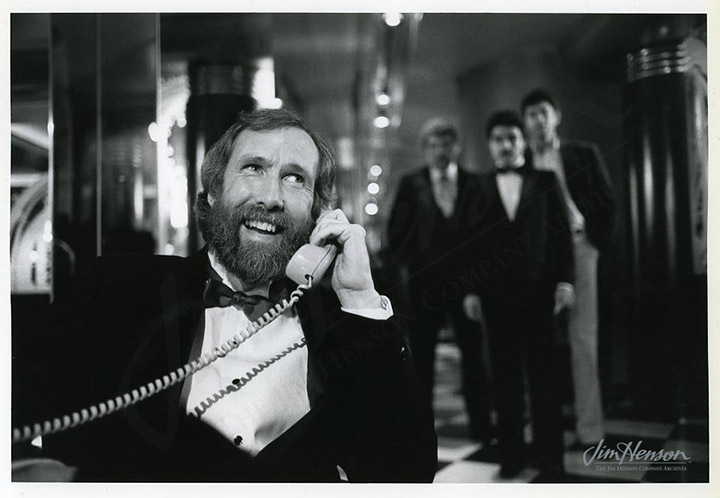 This was Perkins only screen appearance and he is a natural. Bowie of course had made several movies at that point and several more since. In the sequence where they face off, the TV is running in the background, playing an old Abbott and Costello movie. So two icons of pop music are dueling for attention with classic comedians who made movies. 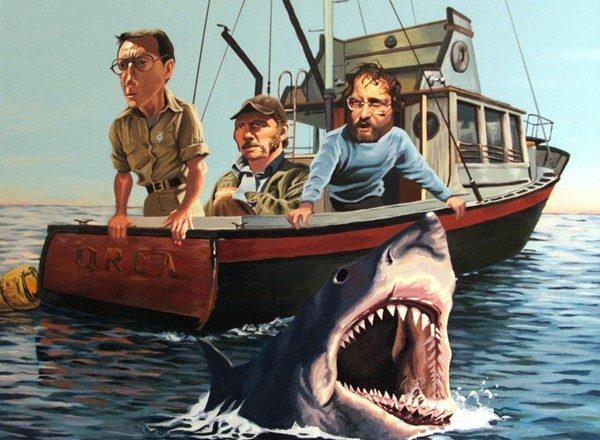 It is an odd juxtaposition but typical of this movie, directed by John Landis, a fan of horror films especially. If you were not aware of it, Landis uses the phrase “See You Next Wednesday” as a signature in all of his movies. Here it is on movie posters in the trailer that Ed and Diana get escorted out of. The line comes from Kubrick’s “2001”. It is no accident that movie references populate this film, even to the point of providing a distraction from a violent fight scene. There are extended segments in Beverly Hills, both in the shopping district and in the residential neighborhoods. Fans of “Chinatown” know that the plot of that classic is mostly a giant real estate swindle, well it turns out that this movie is heavily involved in that same business. The jewels are supposed to help secure financing for a real estate deal being pursued by rich “Iranian” refugees. Large numbers of said refugees found homes in Beverly Hills and so the sound of Farsi being spoken in the stylish salons of Rodeo Drive was not unusual. It turns out that Jack, Diana’s rich patron, is also involved in real estate and that brings some strings of the plot together at the end. The end of the film takes place at the location that most visitors first encounter the city, the Airport. LAX is always busy but we don’t typically have shoot outs there (although it has happened). The odd way in which the stand off resolves itself is again spurred on by Ed’s manner. Through the whole picture Jeff Goldblum plays Ed as if he is exhausted and can barely be bothered to respond to the events taking place around him. The casualness is another one of those L.A. critiques, nothing really seems important to anyone, except the business. The rich and powerful control the political process, the lower level functionaries are corrupt, and the beautiful people get to make their own rules. 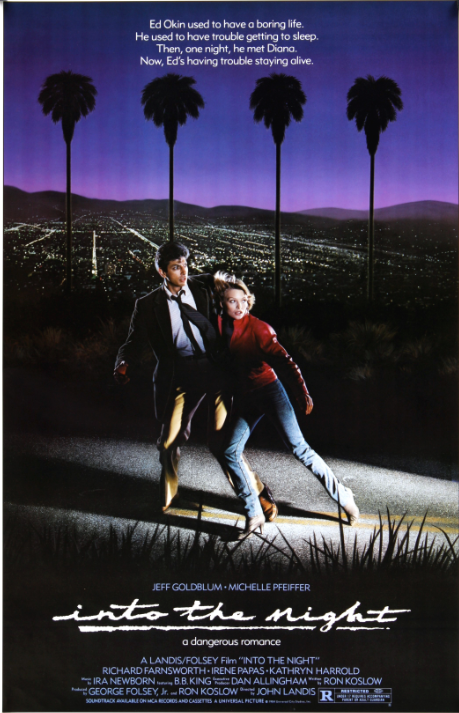 “Into the Night” is not an essential movie, but it is one that I always want people to see because it is a tour of the world that I lived in at the time. It features an odd leading man, and a beautiful leading lady, wandering around the city that I both love and hate. There are plenty of amusing bits and pieces that often have nothing to do with the story, they are just a chance to visit at a touchstone of 80s L.A. culture. The scene at Ships Coffee Shop has nothing to do with the story, and everything to do with where you can go in the middle of the night to get dessert. There is no reason to hide the jewels at the flower market, except that then viewers will get a chance to see the flower market. Jake Steiner is in the movie because he turned being a trainer for Harrison Ford into a career as a pitchman for physical fitness (and getting into the business). A movie with a different plot but a very similar look at L.A. almost fifteen years earlier is “Hickey and Bogs”. 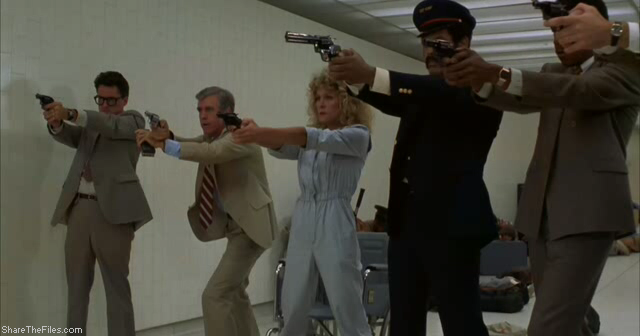 In the place of Goldblum and Pfeiffer, are Bill Cosby and Robert Culp. Maybe it will justify a little analysis down the road, right now I mention it just wanted to show that these sorts of films do repeat themselves and reflect the changes of the city over time. “Get Shorty” in the 1990s and this years “This is the End” cover the same themes. A lot of bad stuff can happen here but if you make it in the movie business , you’ll be alright. Richard Kirkham is a lifelong movie enthusiast from Southern California. While embracing all genres of film making, he is especially moved to write about and share his memories of movies from his formative years, the glorious 1970s. His personal blog, featuring current film reviews as well as his Summers of the 1970s movie project, can be found at Kirkham A Movie A Day. LA after hours is not like NYC. The streets can in fact be dead. Especially in Century City. I new film to look for.